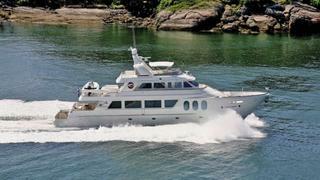 Northrop & Johnson has announced a $750,000 price cut on its MCP 98 motor yacht Eagle’s Nest. Down from $4.75 million, the 29.87 metre motor yacht is now listed for sale at $3,750,000. Delivered in 2007 by MCP Yachts, the tri-deck luxury yacht features exterior styling by Manoel Chaves and interior design by Norris. She is Lloyd’s classed and MCA compliant. This MCP Global Fast Trawler 98 features a 6.71 metre beam and a semi-displacement hull constructed in aluminium. She boasts a semi-shaded bridge deck that features a large Jacuzzi, sunpads, barbecue and ice-maker. Eagle's Nest's capacious interior accommodates eight to 10 guests in four luxurious cabins, including an on deck master stateroom. She also houses two spacious doubles and a twin below. Powered by twin C-32 Caterpillar engines, this versatile motor yacht is capable of very economical long-distance cruising. She is also able to cruise short distances at higher speeds, reaching a top speed of 21 knots. Her range is 3,000 nautical miles at 11 knots. Eagle's Nest is asking $3,750,000.